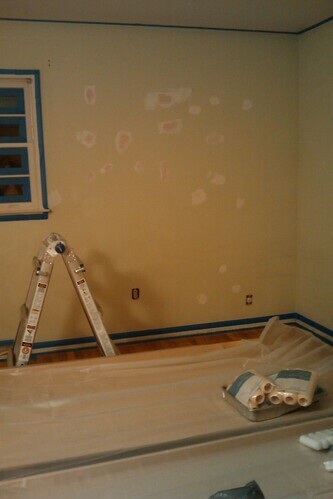 I love redecorating, I love renovating ... but I would prefer to design the remodeling , not to actually do it. Alas, it has been my fate to fix many houses in my life and the hard work involved has left me some lifetime reminders like back problems for example. 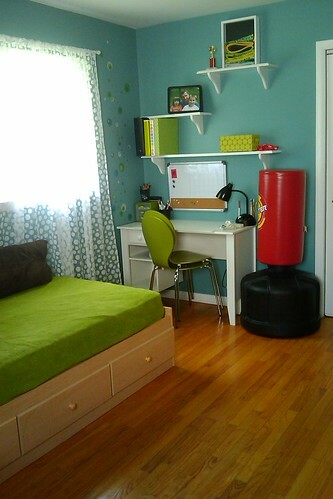 However, there is not a thing I wouldn't do for my kids and their room was the last one that needed renovation in our house. We had left it like that since we moved in and they have been asking constantly when we'll fix it. Once there were no cribs in the room and we have upgraded to twin beds it was time and I knew it. My mom's visit this summer was one of the reasons why we had to rush too, so Saturday afternoon we ended up at Lowes choosing the color. I don't usually have struggle as much deciding on the right color, but this time it was different. 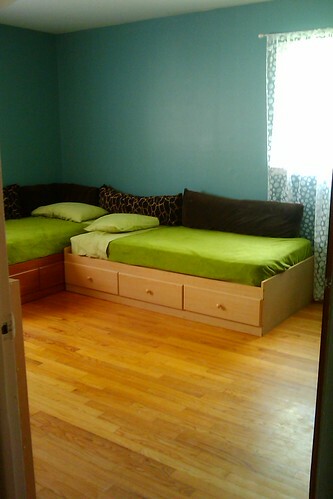 It's a boy AND a girl room...and we had very little money to invest in new furniture. 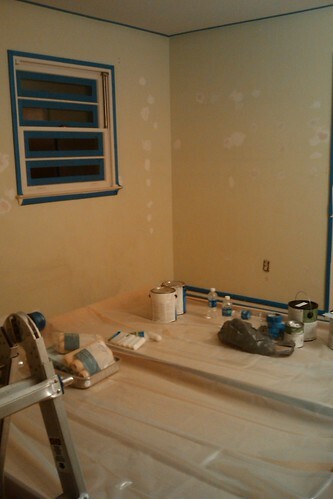 So, I finally came up with the color and we went home and started to prepare for painting. One of the things I don't like in the house are the doors. They are some kind of plywood or something and they look horrible. I've been thinking about painting them white, but I was afraid that the paint might not stick to the surface because of the doors' finish. 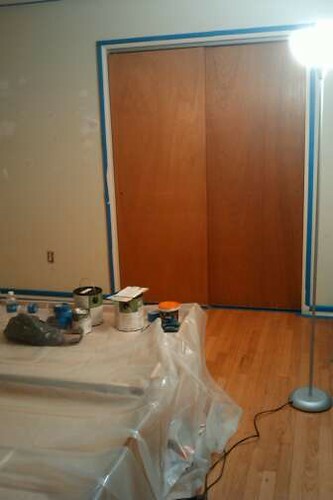 BUT shock and awe, I used primer and voila, we have white doors! 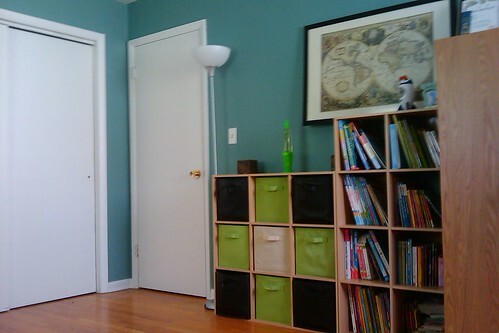 So, this is finally what I came up with, as the only new things we got were the curtains, the desk and the white shelves. 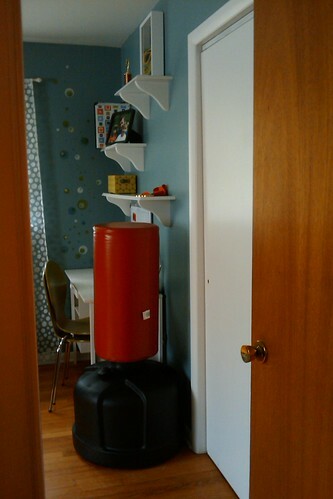 Oh, and the punching bag , which my son got because he won 2 gold medals on the Tae Kwon Do championship. I wasn't completely sure about the color, until we actually put it on the wall. 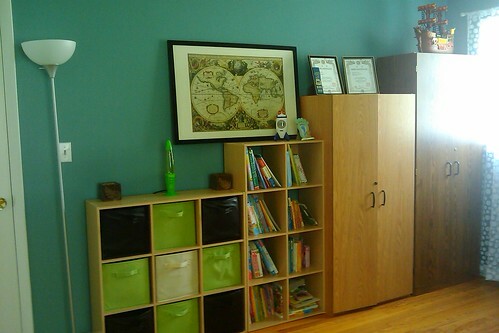 I absolutely love it and the kids had screamed with delight when they saw their new room. I apologize for the quality of the pictures, they were taken with my cell phone's camera.